Counting down the 11 6 days to the 50th anniversary, here are my top 11 stories for each Doctor, continuing with 6 (Colin Baker). 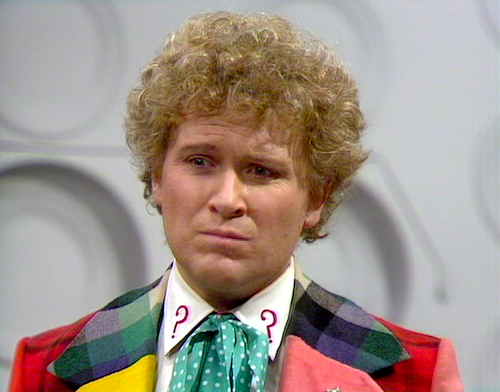 Colin Baker’s Doctor gets a bad rap as “the one with the clown suit,” but the sinking quality of the stories wasn’t for lack of effort on his part. In fact, there are a good number of 6th Doctor stories that are just fine (or would have been if they’d been given the proper time and money). When you travel around as much as I do, it’s almost inevitable that you’ll run into yourself at some point. 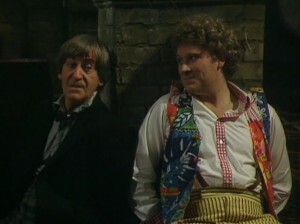 The 2nd Doctor visits a famous scientist in order to get him to stop his time travel experiments. 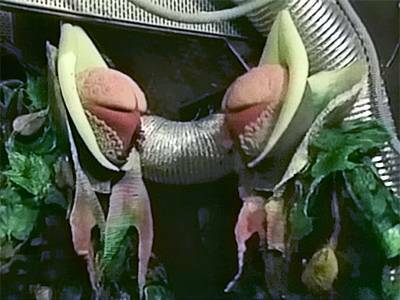 Just after his arrival, one of the scientist’s other experiments, the genetically modified Chessene, a member of the bestial Androgum race, helps the Sontarans invade the space station. Someplace else in time, the 6th Doctor feels the pain of his earlier incarnation’s torture and imminent death. He coincidentally decides to visit the same scientist to seek answers and finds the destroyed station. The 6th Doctor and Peri track the 2nd Doctor and Jamie to a Spanish hacienda where Chessene and the Sontarans plan on obtaining the ability of time travel. Etta: [watching the Doctor on TV] I like that one, the one in the funny clothes. 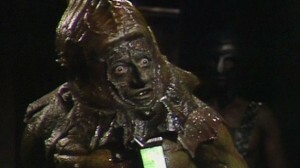 The Doctor arrives on Varos in search of a rare mineral to repair the TARDIS. He and Peri discover that political prisoners are executed on live TV as viewers vote on the outcome. Naturally, as soon as the Doctor and Peri land, they are taken as political prisoners. The colony is ruled by a Governor who lives in fear of his own execution, as each referendum he loses results in him being tortured slowly to death. Meanwhile, Sil, a representative of the Galatron Mining Corporation (and a particularly nasty creature) is negotiating the price of the mineral the colony produces. Along with the Chief Officer, he has been swindling the colony for years. The TARDIS, when working properly, is capable of many amazing things. Not unlike myself. While trying to fix the TARDIS’s chameleon circuit, the Doctor returns to Foreman’s Yard on Totter’s Lane in 1985, where he meets the Cybermen. They have come from the future to change history by sending Halley’s Comet crashing into Earth. Lytton, a mercenary working for the Daleks last seen in the 5th Doctor story Resurrection of the Daleks, is involved in the Cybermen’s plot. Jobel: You know, if the statue HAD been made of stone; I doubt if it had killed YOU. Jobel: No. It would take a mountain to crush an ego like yours. The Doctor and Peri land on a planet with a facility that serves to cryogenically freeze wealthy patrons at the moment of death. What they find is that the facility is being run by Davros, who has set himself up as a savior of the galaxy due to finding a way to relieve food shortages. Guess where the food comes from? Sil: [watching Peri chained to the beech as the tide comes in] Just like in the old days. There’s nothing more enjoyable than watching people suffer. 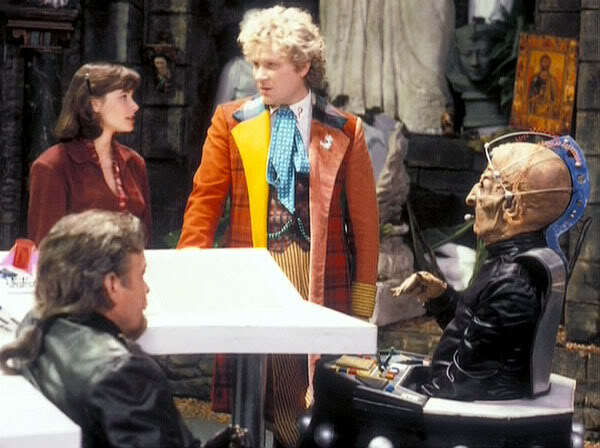 This was the 2nd serial in the Trial of a Time Lord arc that ran through the entire 23rd season in 1986. 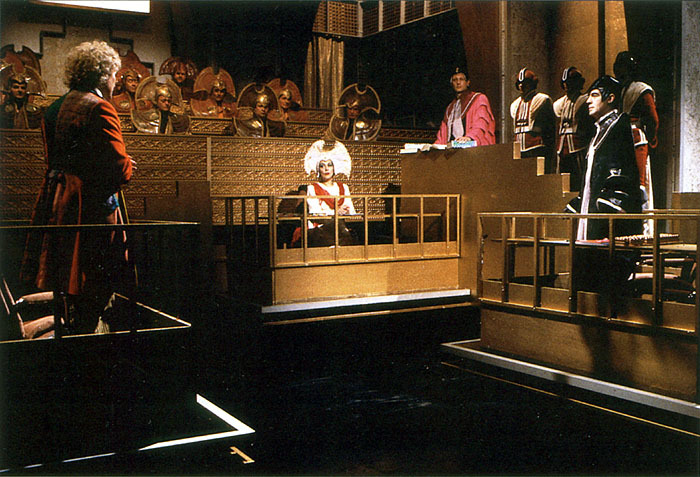 The Valeyard is prosecuting the Doctor for violating the First Law of Time and interfering with other races (a charge that he has already faced as the 2nd Doctor, after which he was forced to change into the 3rd and banished to Earth). In this part, he is accused of interfering on the planet Thoros Beta, where dangerous experiments are being conducted, and his meddling winds up getting Peri killed. I am being manipulated, but the only way to discover why and by whom is to press on. The 3rd serial in the Trial of a Time Lord, the Doctor attempts to show evidence of his good work by presenting a future adventure where he and Mel attempt to prevent a murder on the starliner, Hyperion III. The Rani IS a genius. Shame I can’t stand her. Wonder if I was particularly nice to her if she might… Nope! 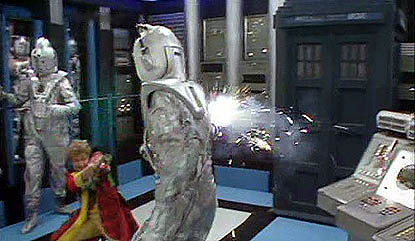 The Doctor has to outwit not one but two competing Time Lords. Both the Master and the Rani are scheming in a 19th Century English village, turning miners into murderous thugs. In all my travelings throughout the universe, I have battled against evil, against power-mad conspirators. I should have stayed HERE! The oldest civilization: decadent, degenerate and rotten to the core! Ha! Power-mad conspirators, Daleks, Sontarans, Cybermen – they’re still in the nursery compared to us! Ten million years of absolute power – that’s what it takes to be really corrupt! 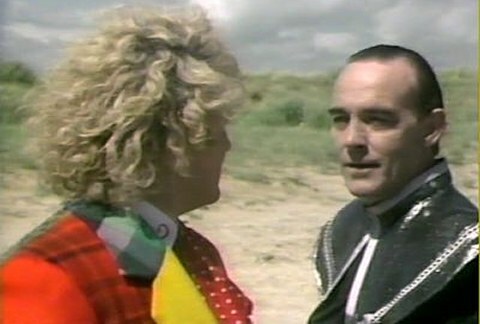 In the final installment of the Trial of a Time Lord, the Doctor discovers (thanks to the sudden appearance of the Master) that the Matrix–the memory bank of the Time Lords in which all of the previous events have been displayed–has been tampered with by the Valeyard. The Doctor goes into the Matrix to discover the truth, which is part of the Master’s plan to get both the Doctor and the Valeyard trapped in the Matrix. Planets come and go. Stars perish. Matter disperses, coalesces, reforms into other patterns, other worlds. Nothing can be eternal. 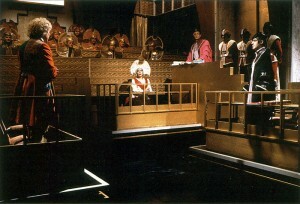 The first part of the Trial of a Time Lord introduces the trial, the Valeyard, and the Inquisitor. 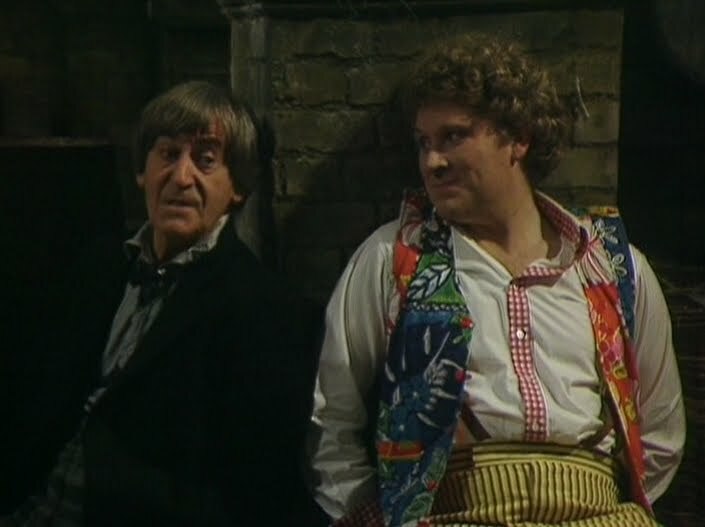 The first bit of evidence for the Doctor’s meddling comes in the form of a trip to Ravolox, where Peri and the Doctor wind up in the conflict between a warrior tribe, a pair of intergalactic con-men, and a god-like robot. The stories I’ve heard about you. The great Doctor, all knowing and all powerful. You’re about as powerful as a burnt out android. The 3rd Doctor first visited the planet Karfel with Jo Grant and Mike Yates about 20,000 years in the future, at the height of its civilization. During this visit, a local artist painted a mural of the 3rd Doctor in the Citadel. Jo gave a locket containing a photo of herself to the father of a Karfelon named Katz. The Doctor reported to the local authorities the “unethical” experiments of a scientist named Megelen on a local life form called Morloxes. The 6th Doctor’s TARDIS became trapped by a kontron tunnel and landed on Karfel once again. By this time, Megelen, as the Borad, now ruled the planet as a dictator with the aid of androids. The Borad created the kontron tunnel, which he called the Timelash, and used it as a means to exile his enemies. With Peri and a young H. G. Wells, the Doctor attempts to free Karfel of the Borad and avert a war with the Bandrils. Well, look at me. I’m old, lacking in vigor, my mind’s in a turmoil. I no longer know if I’m coming, or have gone, or even been. I’m falling to pieces. I no longer even have any clothes sense. The first story of Colin Baker’s run as the Doctor, and it’s a stinker. 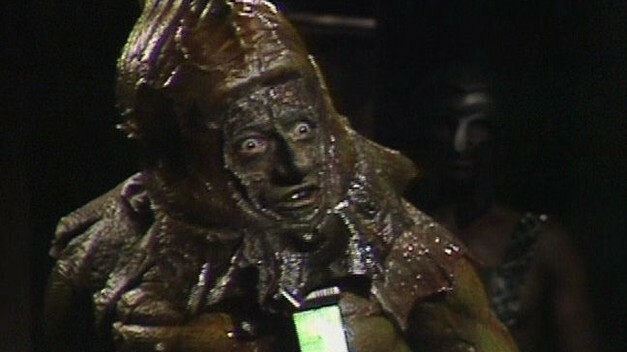 This is consistently held up as one of the worst (if not the worst) Doctor Who episodes ever. A newly regenerated Doctor and Peri become involved and help the planet Jaconda’s elderly former ruler Professor Edgeworth, who is really a Time Lord named Azmael, to defeat Mestor, the leader of a race of gastropods that have taken over the planet. Mestor has kidnapped a pair of twin geniuses from Earth to help work out the mathematical equations to be able to spread his peopls’s eggs throughout the galaxy. The Doctor and Peri attempt to stop Mestor and free the planet’s bird-like indigenous people from the gastropods. This entry was posted in The Big Screen. Bookmark the permalink.